The Northwest Coast Native American cultural area extends along the coast from southern Alaska, Washington and Oregon and down the Canadian province of British Columbia to the northern edge of California as shown on the map. Learn about the life of the people of the Northwest Coast Native Americans. Discover facts and information about the natural resources available, the languages, culture, clothing, their religion, beliefs and ceremonies. The way of life of the Northwest Coast Native Americans Indians was dictated by climate, land, natural raw materials available and the animals, fish, birds, plants, nuts, berries and trees. This was a plentiful area consisting of forests, rivers and oceans and runs along the Pacific Ocean coast from southern Alaska to Washington state. Their subsistence of the tribes was related to agriculture and hunting. The natural resources and materials available provided the food and the clothing of the Northwest Coast Native Americans. The weather and the changing seasons also affected their way of life at different times of the year. Their language, weapons, trading currencies, beliefs, ceremonies and religions were also important elements of their way of life. The Northwest Coast Native Americans who lived on the borders of lands often reflected two types of lifestyles. The climate, land and natural resources that were available to the Indian tribes resulted in the adoption of the Northwest Coast Native Americans culture. Geography of the State of Northwest Coast Native Americans: Heavy rainfall, tall dense forests, oceans, mountains and rivers. Animals: Mountain goats and sheep, deer, moose, bear and elk. The Native Indians who lived on the borders of lands often reflected two different types of lifestyles. 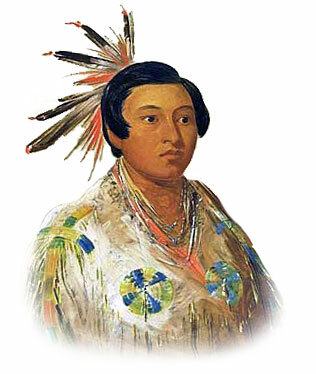 The mild climate, fertile land and a large variety of natural resources that were available to the Indian tribes resulted in the adoption of the hunter fisher culture shared by the Northwest Coast Native Americans along the Pacific coast from British Columbia to the top of Northern California. The Northwest Coast culture area is 1,500 miles long and about fifty miles wide. 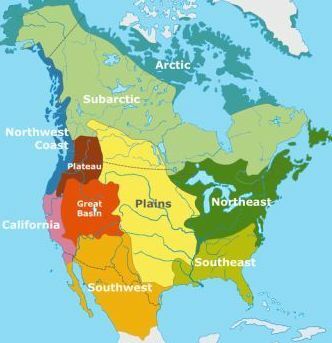 The location of the Northwest Native Americans consists primarily of the coastal areas of Oregon, Washington, Southeast Alaska and British Columbia. The area also includes many islands, the most important being Vancouver Island and the Queen Charlotte Islands. The other tribes of the Northwest Indians known to inhabit the area were the Calapuya, Chehalis, Chastacosta, Chelamela, Clallam, Clatsop, Kuitsh, Lummi, Nooksack, Snake, Tillamook, Willapa and Yamel. This section on Northwest Coast Native Americans group provides facts and information about their languages, the Geography and Environment. The animals and the Plants, Trees and Crops provided their food, clothing, shelter and decorations. Their Houses, Shelters and Homes depended on the materials available to them and whether the home was permanent or temporary but the most usual type of accommodation was the Plankhouse. There are also facts and info about the Religion, Ceremonies and Beliefs of the Northwest Coast Native Americans group. Tribes included those who spoke the Athapaskan language including the Haida and Tlingit and those who spoke the Penutian language including the Chinook and the Coos. The animals were very important to the Northwest Coast Native Americans. There was a variety of many different animals including mountain goats and sheep, deer, moose, bear and elk. Fish and Sea animals including seals, whales, salmon and shell fish. The uses of the animals were varied and included food, clothing, shelter and decorations. Dogs were the only domesticated animals and they were used to pull dog sleds. The different types of Houses, Shelters and Homes depended on the materials available and whether the home was permanent or temporary. 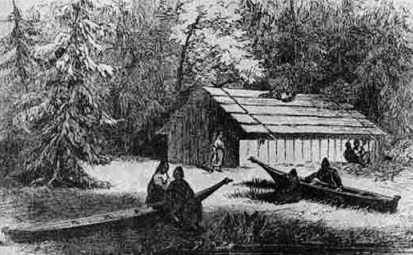 The homes of the Northwest Coast Indians included Plankhouses. Plank Houses were common and were permanent houses built as homes by the fishing tribes of the Northwest Coast, such as the Chinooks. Plank houses are made from long, flat planks of cedar wood lashed to a wooden frame and made good houses for people in cold climates who lived in areas with lots of tall trees. The Religion, Ceremonies and Beliefs were based on Totemism and Animism. Animism was a commonly shared doctrine, or belief, of the indigenous people of North America and Canada including the Northwest Coast Native American tribes. Animism is based on the spiritual or religious idea that the universe and all natural objects have souls or spirits. In this religion it is believed that souls or spirits exist not only in humans but also in animals, plants, trees, rocks etc. This belief is also extended to natural phenomena such as thunder storms and rain and geographic features such as mountains, caves or rivers also possess souls or spirits. The famous customs and traditions of these people included the use of Totem Poles and the Potlatch ceremony which often featured masked dancers. Tricksters feature in the legends and mythology of the Northwest peoples as do heroic figures or "transformers" who transform, or change, the world into its present state. There are also many legends about the Clans. The along the north-west coast there existed the curious custom known as potlatch. A Potlatch is an opulent ceremonial feast held by some Indians of the northwestern coast of North America to celebrate a great occasion such as a marriage or birth. The host of the Potlatch gives gifts to tribesmen and others to display his superior wealth. Personal property is also destroyed in another show of wealth and generosity. Those who gave away or destroyed the most property earned the greatest social prestige. Potlatch is a way for people to share their wealth with the community, to strengthen their leadership claims and to earn the respect of the tribe. In accordance with this custom a man might save for half a lifetime in order to acquire the rank of chief by finally giving away his entire goods and belongings at a grand public feast. Totem poles were important to the North Coast Native Americans. Family history was visually displayed outside the home of every Native Indian via a Totem Pole. Totem poles were made of logs which were carved with various symbols including animals, plants, birds, and religious spirits. The physical characteristics of Northwest Coast Indians are dark brown eyes, prominent cheek bones, straight black hair, and scantiness of beard. The skin color of Native Indians varies from very light in some tribes such as the Cheyenne, to almost black in others, such as the Caddo and a yellowish color in such as the Flatheads. The languages of the Northwest Coast Native Americans included Chinookan, Athapaskan and Penutian languages. Penutian encompassed a large division of languages spoken in the Pacific northwest, near the Columbia River basin, including Chinookan, Tsimshianic and Utian. The Northwest area includes the States of Oregon and Washington. The Geography and Environment can be generally described as a region with heavy rainfall, tall dense forests, oceans, mountains and rivers. All the Native Americans lived near the water, either the Pacific Ocean or an inland river or lake, and relied heavily on water for their survival. A combination of the cedar tree forests and salmon filled rivers provided a good living in an area which was rich in natural resources. The Northwest Coast Native Americans! Discover the vast selection of pictures and videos of Northwest Coast Native Americans. The pictures show the clothing, weapons and decorations of various Northwest Coast Native Americans that can be used as a really useful educational resource for kids and children of all ages. Our series of videos enable fast access to the images, pics, paintings and pictures together with information and many facts. We hope that this article on Northwest Coast Native Americans will assist in your studies or homework and that you will enjoy watching the videos featuring many pictures of the Northwest Coast Native Americans. A great educational resource for kids on the subject of Northwest Coast Native Americans.